This is the second in a series of observations, hypotheses, thoughts, and considerations about the universe. Explore the philosophy of Seven Degrees of Illumination. From imprisonment to freedom, darkness to light, sleep to wakening. 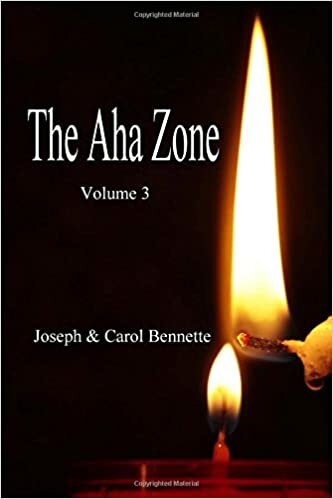 What will your life be like in… The Aha Zone? From seven degrees of illumination to body metaphors and language, The Aha Zone explores the human experience from the authors’ unique perspective. Read insights about fear, justification, evolution, choice, prejudice and bias, thinking errors, and consciousness. Also available in Hardbound edition. Surrogate Healing uses a person’s own judgments and perceptions to heal. It is the secret “Back Door” to your most powerful healing faculties. Turn the negative emotions and energies of others into a beneficial force. Discover an untapped healing potential. There are literally hundreds if not thousands of speed reading courses available today – many for free online. This book is NOT a speed reading course or method. It is intended to significantly speed up your current reading method. Click or tap here to purchase the print version of this book. A critical and enlightening look into how our magnificent brains can help us out a lot – and get us into deep trouble. Fortunately, our big brains have the capability to solve their own thinking errors. Have you tried the patches, the pills, the gums, cold turkey? Are you feeling frustrated because you just can’t quit smoking no matter what you do? Or do you quit over and over and over but never for good? This book may be the solution you’re looking for.